They say the way to a man’s heart is through his stomach. 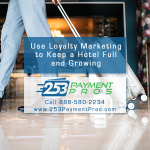 If that is true, then as hotel marketing strategies go, improving your hotel’s room service options could be the way to capture the affection and loyalty of guests, and help boost revenue, too. In the second of two articles on hotel marketing strategies, we lay out three more tactics that can help you turn room service into a point of differentiation to grow a hospitality business. In part one we gave the first of our four hotel marketing ideas that can help you reboot your hotel’s room service in order to make it cost effective and create a competitive advantage for you with travelers, which was to stop thinking about room service as an elaborate menu or as a one-size-fits-all menu. Instead, we advise that you think about five different types of hotel guests that might choose your hotel, and create room service options that are personalized based on guest personas. Now we will continue the conversation with three more hotel marketing strategies based on improving room service in your hotel. And it’s worth pointing out that these same tactics could help you attract customers and boost revenue for a hotel restaurant, not just room service. Travelers stuck in their rooms due to weather, fatigue, illness or who are traveling with others might want to watch a movie, read a book or surf the internet. Create room service options bundled with selections, such as a continental breakfast and WiFi package for travelers or a movie, pizza and popcorn bundle for guests traveling with kids. Buy copies of a book of the month based on popular reading lists. Or collect books left behind and set up a library where guests can leave something they finished reading and take something they haven’t. Provide copies of local interest magazines (wineries, restaurants, museums, state parks or local attractions) and encourage local publishers to provide your guests with in-room copies featuring local tourist destinations, shopping and other destinations that will help boost the local economy. Grocery stores, big box retailers and countless other types of retail businesses have been marketing products and even services using samples for decades. Why not promote your room service options the same way? Set up a guest hospitality station right in the lobby with a few choice samples and photos of some of your most popular room service items. On your display, note how quickly you could have the menu item delivered to their room or point out cost and time benefits vs. local dining options. Providing guests with a sample of one of your menu items upon check in or arrival in their room could set the stage for an order during their stay, especially if you have done your homework and attempted to provide them with an item personalized to the traveler persona they most represent. Do the marketing needed to make using and ordering room service as convenient and appealing as possible. If people don’t know that your room service is something special, you can’t blame them for disregarding it. Promote services with strategically placed advertising in-room (perhaps by the phone and television), with posters on elevators, hallways and walkways, using digital displays, in engaging lobby displays, leaving pool areas, leaving fitness center, etc. Don’t neglect digital options in the tactics of your hotel marketing strategies. Send emails featuring your guest-favorite room service items to registered guests a few days before their arrival or even during their stay. 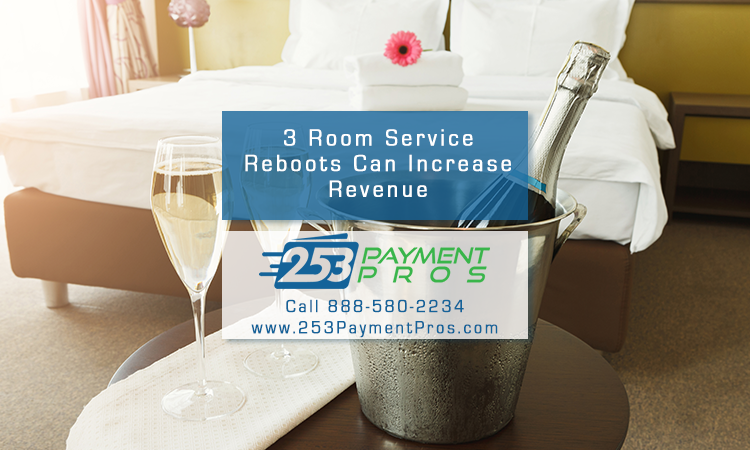 Allow them to pre-order and pre-pay for room service items at a discount, digitally. Feature your segmented room service options on your website and social networks. Give desk staff scripts to deliver based on traveler persona at the time of check in noting the room service option most suitable to them and giving them a room service voucher featuring a special offer at the time of check in (especially for repeat visitors or those loyal to the chain. If you have a display or samples in the lobby, set up computer (or even old-fashioned paper form and pen) to encourage guests to take advantage of a special offer and order right from the lobby for later. Over the years hotels have provided room service as a standard, but many have done so without approaching room service as a strategic part of their hotel marketing mix or expecting it to be a profitable and important part of the hotel guest experience. 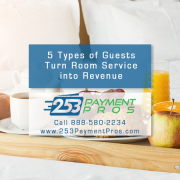 With hotels discontinuing room service due to lack of ROI, the door is opened to others to turn it into a selling point that helps to differentiate their hotel and become more profitable. 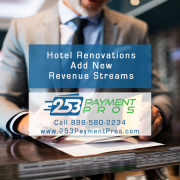 We offer hotel financing that can be ideal for hotel renovations or improving room service as part of hotel guest amenities. 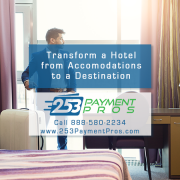 In addition, we can partner with your hotel to create an efficient hotel credit card processing solution that boosts revenues through easy impulse buying and hotel loyalty marketing.